Atmospheric event cinema, showing a short film by Chris Market, set in the aftermath of WWII. In the aftermath of World War III, survivors live underground in a post-apocalyptic Paris where scientists research time travel to rescue the present. 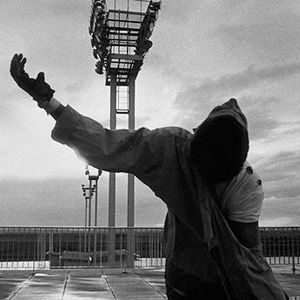 We wrap our sonic Atmosphere trinity with this acclaimed short film by Chris Marker. A film largely of still images that inspired Terry Gilliam’s film Twelve Monkeys (1995). With narration by David McKechnie, sound artists Tim Shaw & Sébastien Piquemal will re-score the film in this world premiere performance that explores digital mobile technology and hyperlocal networks for surround sound diffusion. Ensure you bring your devices fully charged, and keep them switched on throughout. With a special focus on analogue, electronic and digital sound, New Media Scotland’s Atmosphere expanded cinema series at the festival uses teams of guest artists and creatives to work with technology old and new, multi-sensory interactives and live elements too. First premiered at the 2010 Edinburgh International Film Festival, Atmosphere re-imagines the concept of atmospheric movie theatres from the 1920s and 30s. Audiences have experienced over fifty unique cinematic events to date including Brigadoon, Logan’s Run and Spirited Away. Expect some smoke and mirrors, before the bells and whistles at these three special late night Friday night events.